Congratulations for taking up the role of the Toastmaster of the Evening! Are you ready to shine? It is an important and challenging role which comes with a lot of responsibility. The overall success of the evening depends in a great degree on you. But don’t be scared! Here you will find all the information you need to make the meeting a great success, and if you still have questions, your VP Education is there for you. To get an understanding of your role as well as of the other meeting roles, there are several resources you can choose from. On the site of our club you will find the descriptions of different meeting roles if you go to Member Zone/ Meeting Roles. 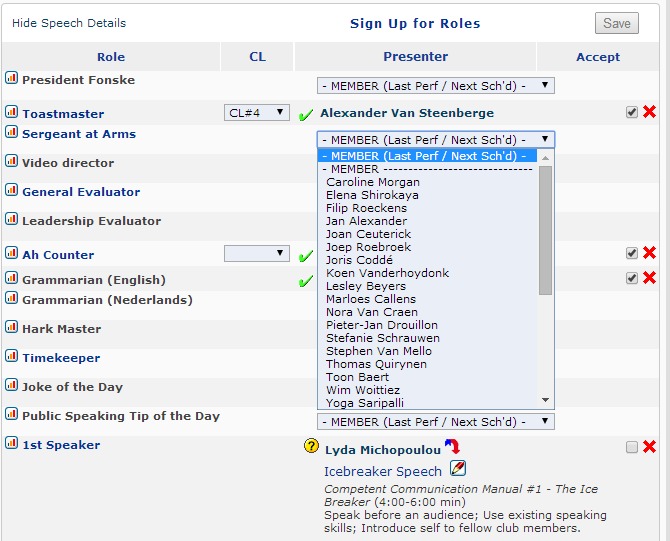 In Easy Speak, if you click on any role in the meeting agenda, you will find the role description from the Easy Speak Knowledge Base. At the end of your Competent Communicator manual you will also find the description of the Toastmaster role (page 73) and other meeting roles. The Toastmasters International site has information on your role: http://www.toastmasters.org/Members/MemberExperience/MeetingRoles/Toastmaster.aspx. Not to get lost in all these resources, it is enough if you choose one which suits you most. Our club site will contain the most relevant information from our club’s perspective. In addition, because being the Toastmaster is a great way to practice not only your public speaking skills, but also your leadership skills, this role counts towards credit in 5 out of 10 projects in Competent Leadership manual. If you haven’t completed all of them, pick a project and read specific instructions for your role. They will provide additional guidance. Believe it, at the end of the meeting you will experience a sense of achievement no other role can give! 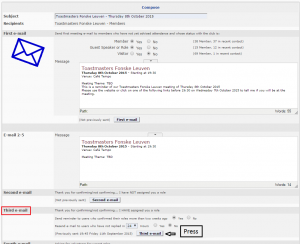 10 days before the meeting Prepare an email announcing the theme of the meeting, inviting the members to confirm attendance and fill in roles. Send the email to the club’s secretary, and the VP education. The club’s secretary will forward the email to members. Do not send it directly through Easy Speak. Add the theme of the meeting to Easy SpeakDon’t worry if not all roles are filled in. VPE will take care of providing the speakers for the meeting and there is enough time to distribute the supporting roles. 7-5 days before the meeting Confirm participation of all speakers, request titles of speeches, and introductions. Ask the speakers if they are going to make a presentation. If yes, coordinate with the speaker who is going to bring the laptop. You can contact the speakers via Easy Speak (they will receive your message by email and will be able to reply to you so that you receive an answer in your mailbox) or ask VPE for the list of members’ emails.Assign the unassigned roles on Easy Speak. Make sure you do “send third email” to inform members that you assigned them a role.Tip: You can assign roles without waiting for people to volunteer. When people receive a role assignment email, the options to respond are: I take the role/ I will not be present at the meeting. So it is good for you in either case: either you get a better view of the attendance for the meeting or you get the role filled.Tip: We don’t usually follow this in our club, but according to the role description in in different sources, finding and briefing of the supporting roles is the responsibility of General Evaluator, so feel free to delegate, if you prefer. 5 days before the meeting Prepare an email inviting all members and describing the speeches that will be presented at the meeting. Send the email to the club’s secretary and VP Education. The club’s secretary will forward the email to members. 5 – 0 days before the meeting Fill up the supporting roles: If necessary contact people individually to confirm participation/ assign roles. One person can have multiple roles. Make sure there is a word of the day picked by the grammarian; add it on Easy Speak – this way it will be printed on the agenda so everyone can see it.Tip: You can re-assign roles if people do not respond to your role assignment. For example, you can assign a role to someone on Sunday, if they don’t accept by Tuesday, you can reassign to someone else. If still no luck, reassign again on Wednesday. 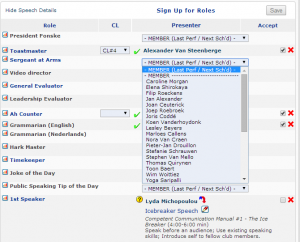 If with those steps still not all the roles are filled, don’t worry, VPE will help you fill them right before the meeting.Tip: There is a “detailed agenda” in Easy Speak that is a useful guide for planning and during the meeting for the toastmaster of the evening. Before the meeting Your main role is to prepare introductions for the speakers, to warm the audience for them, remember they are the stars of the evening, and help them shine! Here is a resource with useful tips on preparing introductions: http://toastmasters.wikia.com/wiki/IntroductionMake sure to get speakers information correctly (e.g. names pronunciation, speech titles).Also prepare welcoming words, transitions and closing words.Bring printed agendas. Bring enough spare copies for guests and those who did not confirm attendance. The sergeant at arms brings the projector, club’s banner, pens, ballots, extra badges. No laptop is available, so if one is required coordinate that with the speaker. Bring you Competent Leadership manual with you to the meeting. At the meeting Arrive early. Ensure agenda’s and voting ballots are distributed; members’ name tags are displayed for them to pick up. Confirm with the members with supporting roles that they know what they need to do. Ensure the timer has the necessary equipment.Tip: “Ensure” does not mean you have to do it yourself. Feel free to delegate to club officers, genera evaluator and other fellow club members.Don’t be put off by last-minute changes. There will always be volunteers to replace an absent role. Roles like Hark Master, Public Speaking Tip of the day, and Joke of the day may be skipped, or you can ask for impromptu volunteers during the meeting. 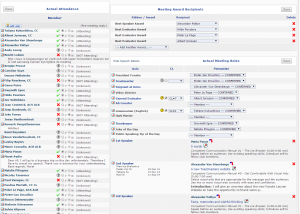 One member can perform several roles at the meeting.Check if there are guests at the meeting. You may need to adapt the meeting depending on whether guests are present or not. If no guests are present, skip the explanations of the small roles (ah-counter, hark master, timer, etc. ), only give the word to the grammarian to present the word of the day. For the other roles just mention the name of the person filling the role and where he/she sits. If guests are present, do not skip the explanations and also remind the Table Topics master to explain the rules of Table Topics for the guests. The difference in timing can be compensated by adjusting the duration of the Table Topics part of the meeting.Ask a fellow member to evaluate you role for a Competent Leadership project. Give the manual to the evaluator.Start the meeting on time.Voting for Best Speaker, Best Evaluator and Best Table Topics speaker is usually done after Table Topics. Counting of votes is done by the Sergeant at Arms. Make sure the meetings end on time: the table topics part should end at 9.40 pm. After the meeting Complete the awards: Best speaker, Best evaluator, Best Table Topic, on Easy Speak. Confirm the actual roles: In case there were changes on the allocation of roles during the meeting, adjust on Easy Speak accordingly. Coordinate with the video director to upload the meeting’s video on you tube and add the link to the meeting’s description on Easy Speak Close the meeting in Easy Speak.